The CrossFit Open begins this week, and you can feel a collective excitement and anticipation building amongst the CrossFit community. We will be posting videos each week for ways to modify the Open workouts so that pregnant women can participate safely with modifications and substitutions. There will, undoubtedly, be some backlash on the interwebz regarding the safety of doing CrossFit while pregnant, so I am posting an article I wrote a while back about the normalcy of pregnancy and childbirth as well as my “Birthing Manifesto”. Most people know what I do in Life. But if you don’t- I am first a Mom of 2. 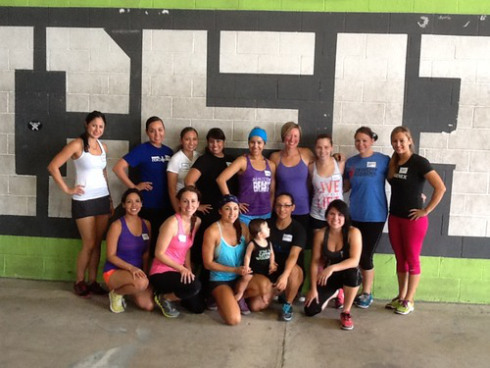 I am also a certified CrossFit Coach (4 years), Birth Doula (65+ births), and a Childbirth Educator (5 years). So I would say I have a little experience in this arena. I don’t know everything but I’ve seen A LOT- in my childbirth classes, in the gym, in the hospitals, and in talking with hundreds of pregnant and postpartum moms. It has shaped my thinking, the way I approach teaching and supporting pregnancy and birth, and has catapulted me into doing lots and lots of reading and research. My partner, Dr. Lindsey Mathews, and I own and operate BirthFit, where we develop personalized programs for pregnant and post-partum moms, put on Pregnancy Seminars and classes and travel around presenting at various gyms around the country. This is our passion. Our true path. I would say my Professional Philosophy is fairly moderate. My personal choices and philosophy differ from what I think about birth as a whole. This is something that has been vital to my career in this field. After all, each woman is as varied as her fingerprint and each woman has a different desire for her birthing and pregnancy experience. It’s not up to me to sway her to my side. I’m only here to guide and provide information. Here are some of my core beliefs about Pregnancy and Childbirth. If you are thinking of getting pregnant or already are, this is a great exercise to do. What do you really think? What areas do you find you need more information about? What is your manifesto? Birth is Normal. It’s not a medical emergency waiting to happen. Women are Strong. Much stronger than they realize. Women have in them the deep-rooted inner strength and encoded blueprint of how to have a baby. Our bodies, as women, are made to do this. And 9 times out of 10 birth will go off without a hitch if we just get out of the way and allow it to unfold on its own. Moms have a monumental responsibility to their growing Baby(ies) to provide them with the best environment possible: air, water, quality food, and exercise. It is irresponsible to lay around and use pregnancy as an excuse to eat crappy food and lay on the couch for 9 months. What is good for one Woman may not be good for another. Just because your mom, best friend, or sister did things one way or used one particular care provider doesn’t mean it’s right for you. Women must arm themselves with information. Care providers are people- just like us. They know a LOT but they don’t know it all. Women must learn to trust themselves and their body. Tuning in to your Instincts will benefit you a million times over- not only in Pregnancy and Labor, but also when your Baby is born and you’re wondering if they are in some sort of pain, if they hate you, or if they just have gas. It’s probably the last one. Birth is 80% about Mindset. Find a program (like Hypnobirthing) that will help you get in the right frame of mind to tackle labor. If you CrossFit, you’re already 50% of the way there. There are quite a few factors that play into how your birth is going to play out. Some of them you can control, some you can’t. If your goal is a natural birth, arm yourself with tools and knowledge on how to make that happen. But if things need to go a different way for safety or health- related reasons, it’s ok.
YOU ARE NOT A FAILURE. NO MATTER WHAT. BIRTH IS NOT A “TEST”. THERE IS NO PASS OR FAIL. See above. Read it again and tattoo it on your forehead. There is a time and a place for everything- inductions, interventions, epidurals, c-sections. They are overused. So be informed and ask questions. Your care provider, you, and your nurse are all a Team. Make decisions as a Team. Then see below. The NUMBER ONE way to have the birth you desire is to find a care provider you are on the same page with. Be it a Midwife or an OB/GYN- this is the most important decision you’ll make in your pregnancy. They don’t just catch the baby at the end. Their policies and philosophy determine how your pregnancy and birth will go. On the same line, hire a Doula. I’ve never met anyone who said, “That was a waste of money.” Most of the times it’s the Dads that say “Dang. I was so against hiring you but I am sooooooo glad you were here!” Then we hug it out and they become my biggest advocate. Know that Birth IS a Business. Period. YOU are the consumer. From the shiny aisles at Babies R Us to Vaccine info to the production of A Baby Story- it’s all marketed to you. Same with your Provider. If you don’t like what they are telling you- leave. Find another one. I get it. They are “nice.” You are not having them over for dinner. One of my students changed providers at 38 weeks. She ended up having the birth of her dreams. Be courageous. You may have other kids, but this is THIS baby’s only time to be born. A. KB Complex: Use a heavy-ish weight and don’t put the KB down between movements. 3 Rounds: After each round, rest for 60 seconds. For the Thrusters, use a medium weight where you can perform all 10 unbroken. If you cannot maintain a PERFECT bar path, use a KB or DB for 1 arm snatches. For the pull-ups, use a band if needed. Work on activating your lats. 0 comments to " CrossFit While Pregnant and a Birthing Manifesto "